Ho Chi Minh (1890 - 1969) Leading Vietnamese revolutionary. Born Nguyen Sinh Cung. AKA: Nguyen Tat Thanh, Van Ba, Nguyen Ai Quoc (Nguyen the Patriot). Founded the Indochina Communist Party (1929). Ho was the political leader of the Viet Minh and the undisputed leader of North Vietnam after the Geneva Accords (1954). A steadfast nationalist he was determined to reunify Vietnam. 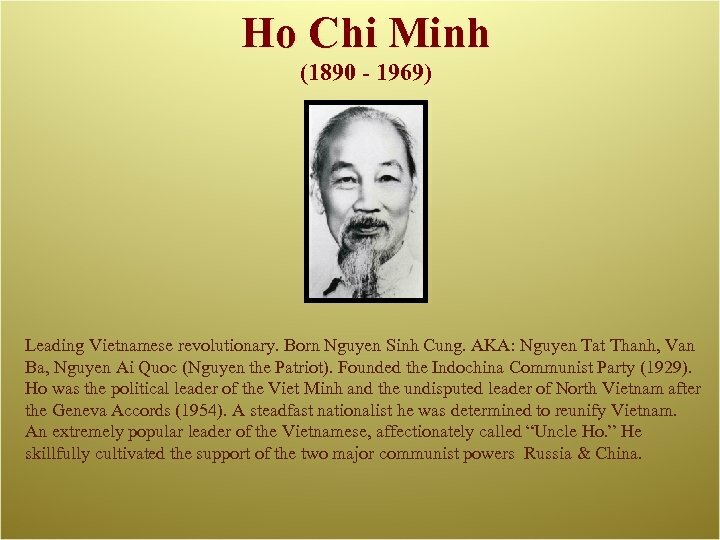 An extremely popular leader of the Vietnamese, affectionately called “Uncle Ho. ” He skillfully cultivated the support of the two major communist powers Russia & China. 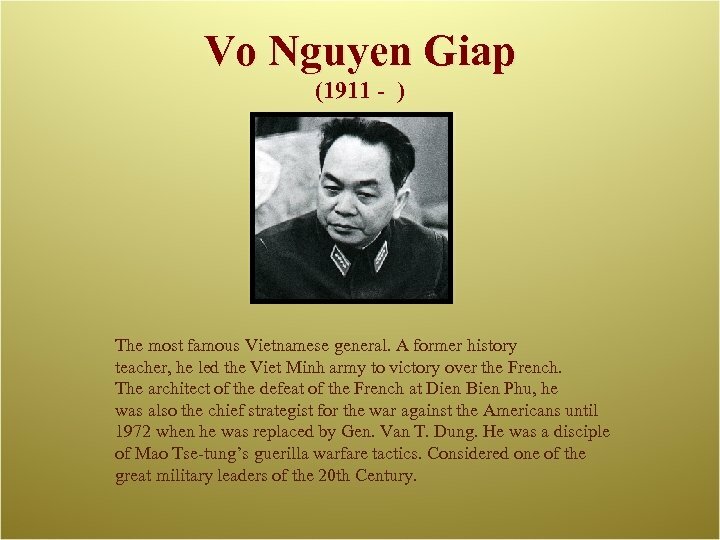 Vo Nguyen Giap (1911 - ) The most famous Vietnamese general. A former history teacher, he led the Viet Minh army to victory over the French. The architect of the defeat of the French at Dien Bien Phu, he was also the chief strategist for the war against the Americans until 1972 when he was replaced by Gen. Van T. Dung. He was a disciple of Mao Tse-tung’s guerilla warfare tactics. Considered one of the great military leaders of the 20 th Century. Pham Van Dong (1906 - 2000) After Ho Chi Minh and V. N. Giap, the most influential leader of Vietnam. 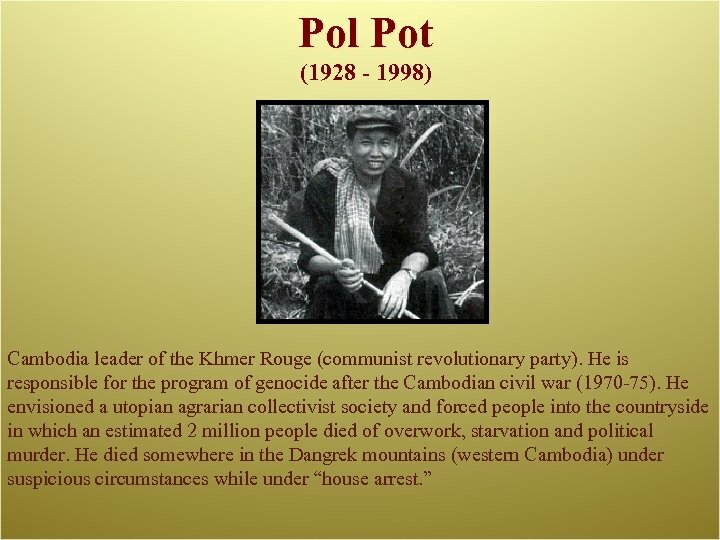 He was active in both the French and American Indochinese Wars as a political leader. He was Premier of North Vietnam (1950 -75). Dong was the head of the Viet Minh delegation to the Geneva Conference (1954) and was the unseen force behind the secret Paris Peace talks (1970). After Ho’s death in 1969 he became the most public political leader in North Vietnam. 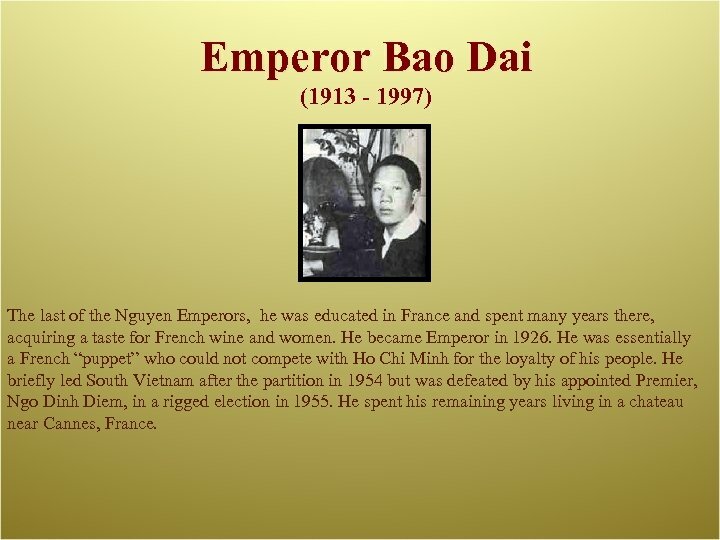 Emperor Bao Dai (1913 - 1997) The last of the Nguyen Emperors, he was educated in France and spent many years there, acquiring a taste for French wine and women. He became Emperor in 1926. He was essentially a French “puppet” who could not compete with Ho Chi Minh for the loyalty of his people. He briefly led South Vietnam after the partition in 1954 but was defeated by his appointed Premier, Ngo Dinh Diem, in a rigged election in 1955. He spent his remaining years living in a chateau near Cannes, France. 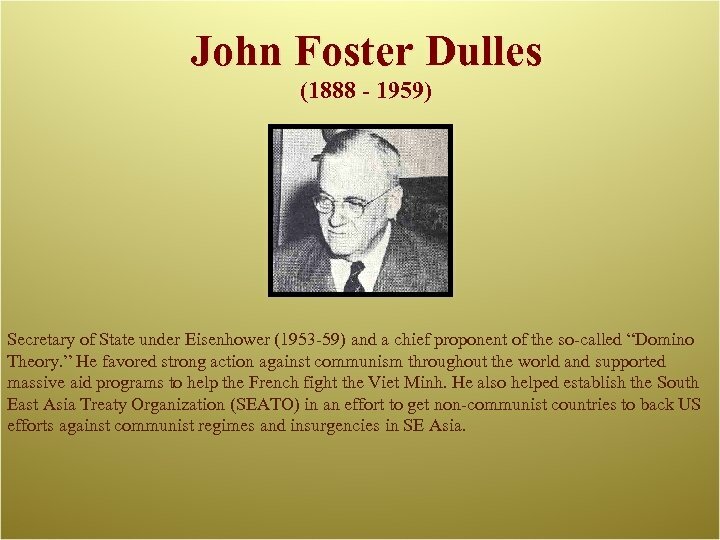 John Foster Dulles (1888 - 1959) Secretary of State under Eisenhower (1953 -59) and a chief proponent of the so-called “Domino Theory. ” He favored strong action against communism throughout the world and supported massive aid programs to help the French fight the Viet Minh. He also helped establish the South East Asia Treaty Organization (SEATO) in an effort to get non-communist countries to back US efforts against communist regimes and insurgencies in SE Asia. 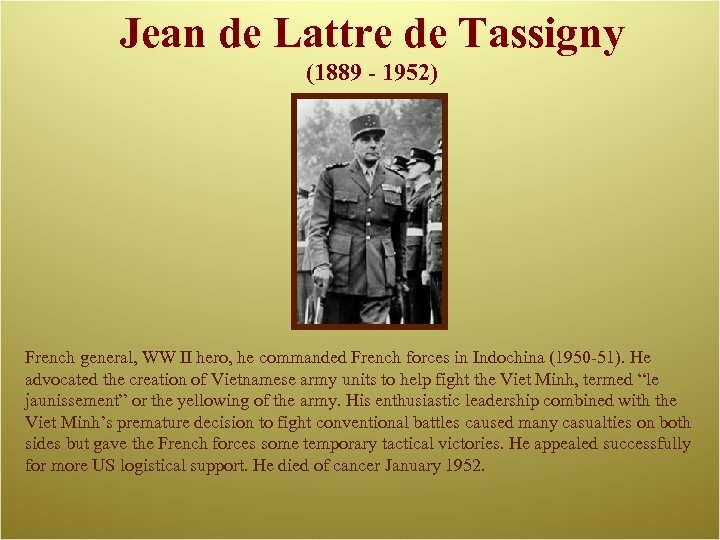 Jean de Lattre de Tassigny (1889 - 1952) French general, WW II hero, he commanded French forces in Indochina (1950 -51). He advocated the creation of Vietnamese army units to help fight the Viet Minh, termed “le jaunissement” or the yellowing of the army. 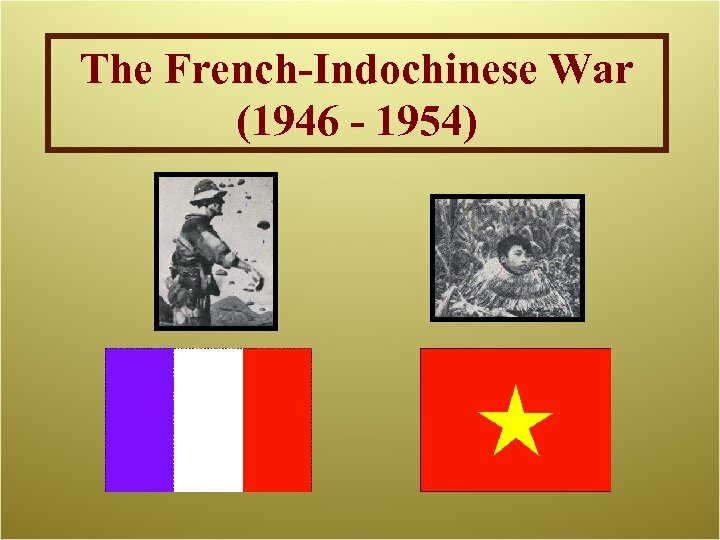 His enthusiastic leadership combined with the Viet Minh’s premature decision to fight conventional battles caused many casualties on both sides but gave the French forces some temporary tactical victories. He appealed successfully for more US logistical support. He died of cancer January 1952. 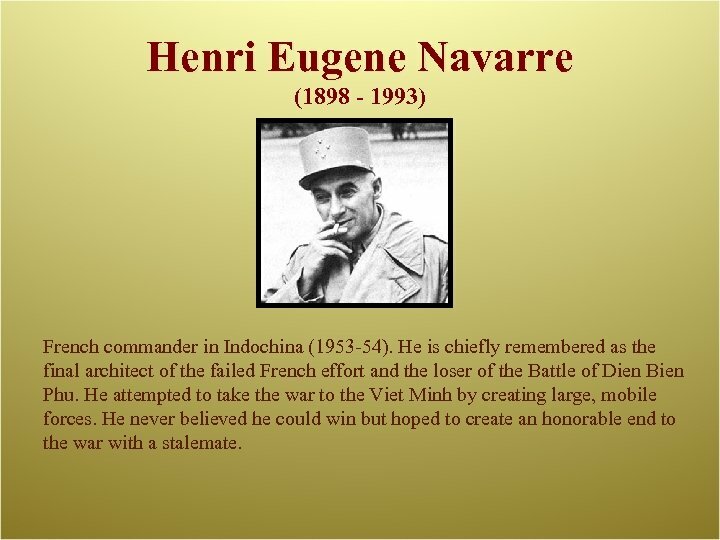 Henri Eugene Navarre (1898 - 1993) French commander in Indochina (1953 -54). He is chiefly remembered as the final architect of the failed French effort and the loser of the Battle of Dien Bien Phu. He attempted to take the war to the Viet Minh by creating large, mobile forces. He never believed he could win but hoped to create an honorable end to the war with a stalemate. 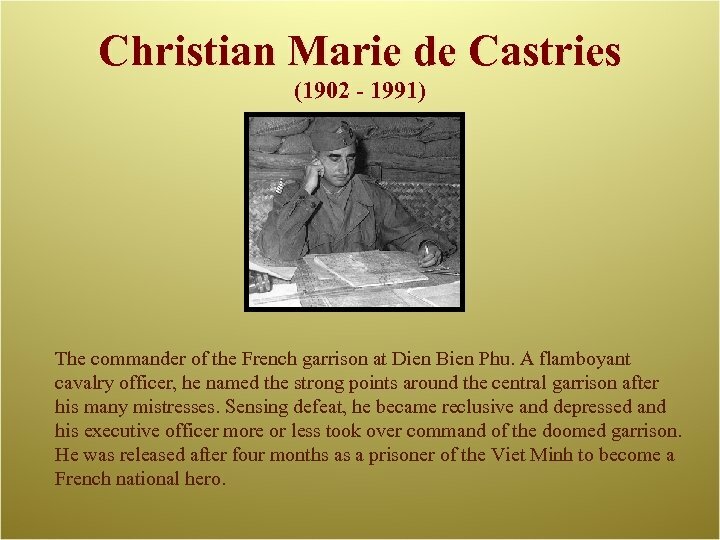 Christian Marie de Castries (1902 - 1991) The commander of the French garrison at Dien Bien Phu. A flamboyant cavalry officer, he named the strong points around the central garrison after his many mistresses. Sensing defeat, he became reclusive and depressed and his executive officer more or less took over command of the doomed garrison. He was released after four months as a prisoner of the Viet Minh to become a French national hero. 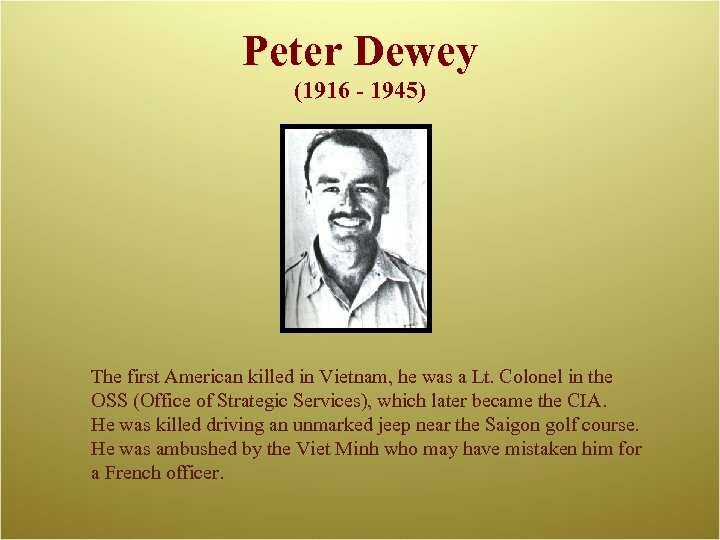 Peter Dewey (1916 - 1945) The first American killed in Vietnam, he was a Lt. Colonel in the OSS (Office of Strategic Services), which later became the CIA. He was killed driving an unmarked jeep near the Saigon golf course. He was ambushed by the Viet Minh who may have mistaken him for a French officer. John F. Kennedy (1917 - 1963) President of the United States (1960 -63). He was a advocate of counter insurgency and encouraged the development of special warfare capabilities. His Vietnam policies were an extension of preceding presidents’ policies of containing communism, the so-called Domino Theory. He was assassinated soon after the overthrow of Diem in 1963. It is unclear whether or not he planned to expand the US role in Vietnam. He did increase the funding and number of US advisors during his presidency. 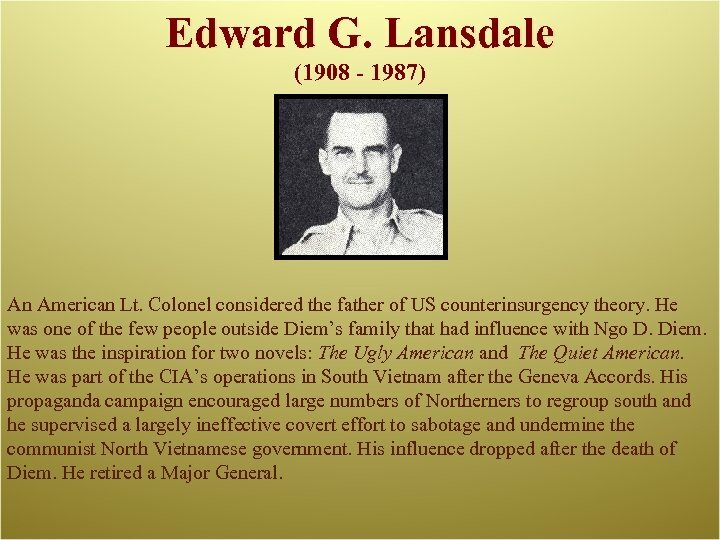 Edward G. Lansdale (1908 - 1987) An American Lt. Colonel considered the father of US counterinsurgency theory. He was one of the few people outside Diem’s family that had influence with Ngo D. Diem. He was the inspiration for two novels: The Ugly American and The Quiet American. He was part of the CIA’s operations in South Vietnam after the Geneva Accords. His propaganda campaign encouraged large numbers of Northerners to regroup south and he supervised a largely ineffective covert effort to sabotage and undermine the communist North Vietnamese government. His influence dropped after the death of Diem. He retired a Major General. 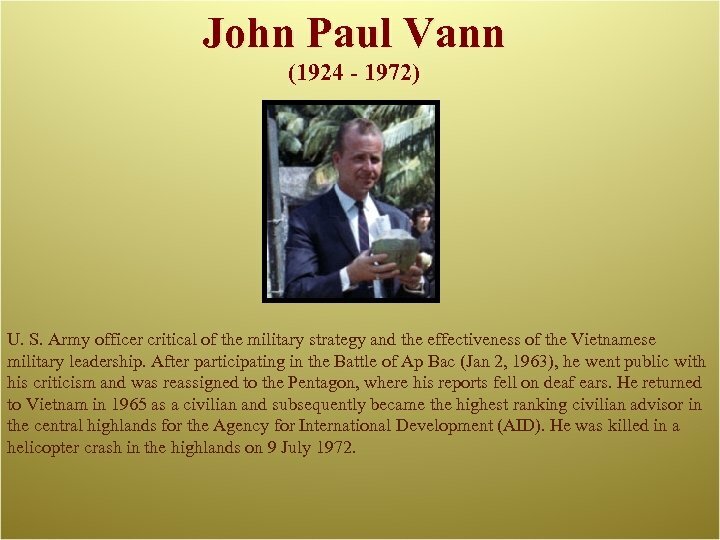 John Paul Vann (1924 - 1972) U. S. Army officer critical of the military strategy and the effectiveness of the Vietnamese military leadership. After participating in the Battle of Ap Bac (Jan 2, 1963), he went public with his criticism and was reassigned to the Pentagon, where his reports fell on deaf ears. He returned to Vietnam in 1965 as a civilian and subsequently became the highest ranking civilian advisor in the central highlands for the Agency for International Development (AID). He was killed in a helicopter crash in the highlands on 9 July 1972. Ngo Dinh Diem (1901 - 1963) President of Vietnam from 1954 -1963. He was a devout Catholic and an anti-French nationalist. He depended heavily on his family for support. He was killed in a US-sanctioned coup d’etat. His government was characterized by corruption, anti-Buddhist activities and nepotism. 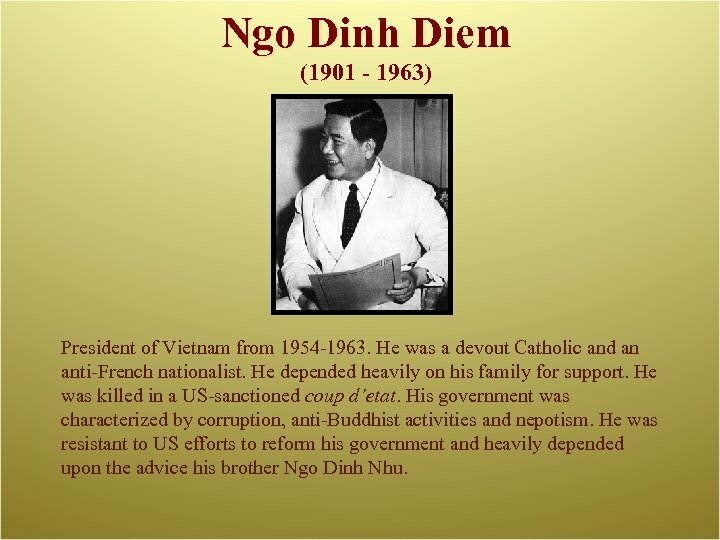 He was resistant to US efforts to reform his government and heavily depended upon the advice his brother Ngo Dinh Nhu. Ngo Dinh Nhu (1910 - 1963) The younger brother of Ngo D. Diem. 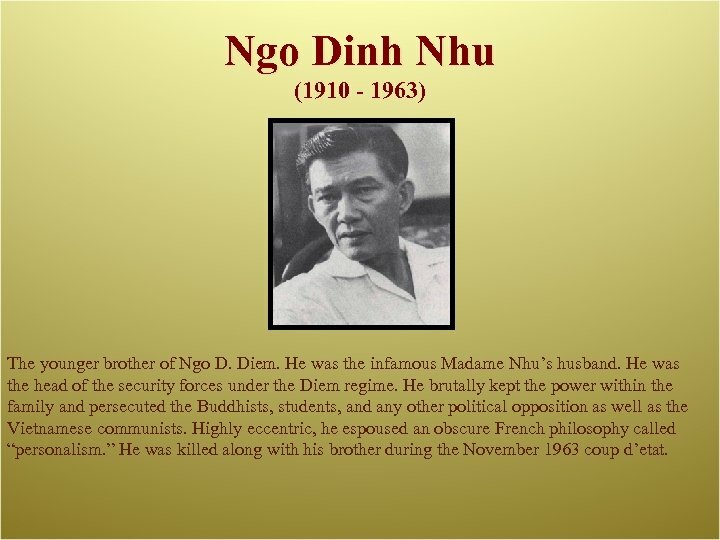 He was the infamous Madame Nhu’s husband. He was the head of the security forces under the Diem regime. He brutally kept the power within the family and persecuted the Buddhists, students, and any other political opposition as well as the Vietnamese communists. Highly eccentric, he espoused an obscure French philosophy called “personalism. ” He was killed along with his brother during the November 1963 coup d’etat. 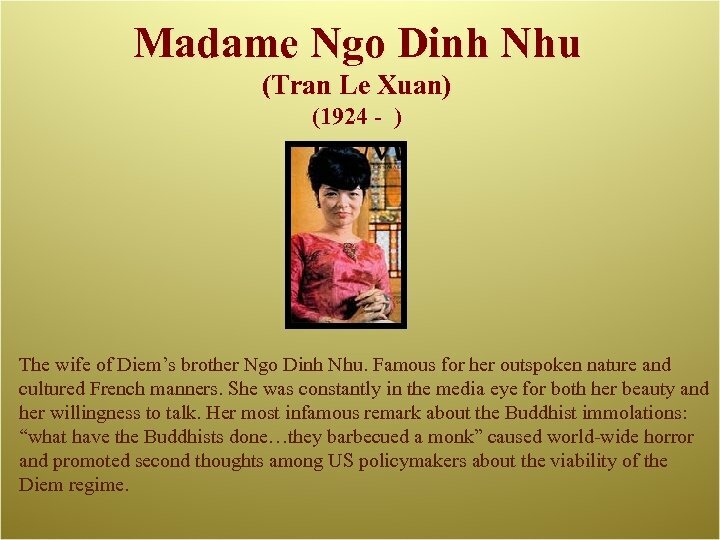 Madame Ngo Dinh Nhu (Tran Le Xuan) (1924 - ) The wife of Diem’s brother Ngo Dinh Nhu. Famous for her outspoken nature and cultured French manners. She was constantly in the media eye for both her beauty and her willingness to talk. Her most infamous remark about the Buddhist immolations: “what have the Buddhists done…they barbecued a monk” caused world-wide horror and promoted second thoughts among US policymakers about the viability of the Diem regime. 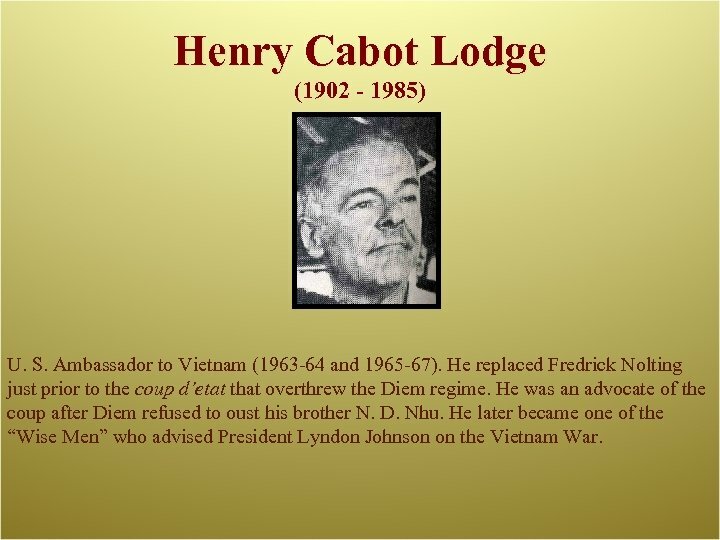 Henry Cabot Lodge (1902 - 1985) U. S. Ambassador to Vietnam (1963 -64 and 1965 -67). He replaced Fredrick Nolting just prior to the coup d’etat that overthrew the Diem regime. He was an advocate of the coup after Diem refused to oust his brother N. D. Nhu. 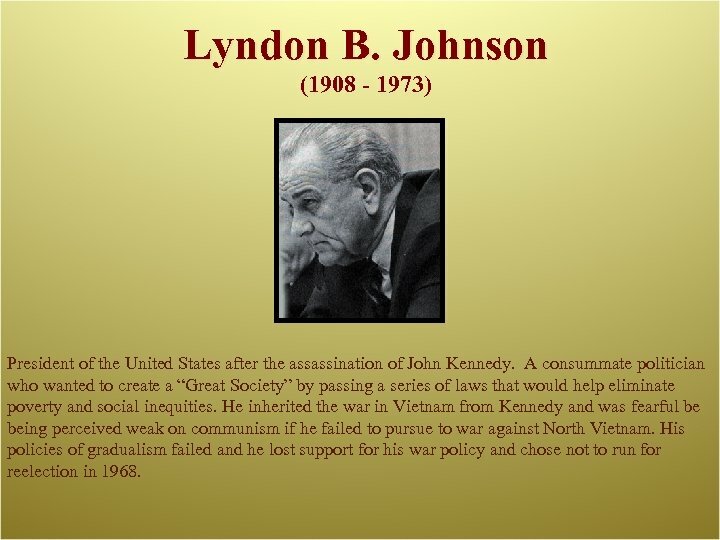 He later became one of the “Wise Men” who advised President Lyndon Johnson on the Vietnam War. 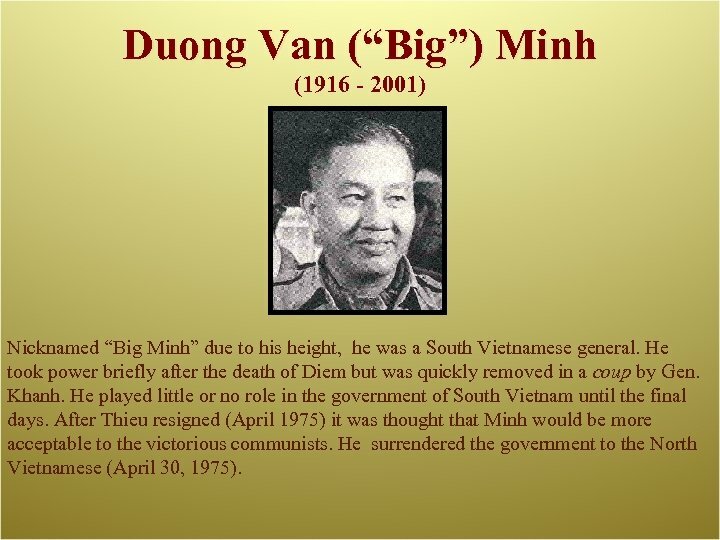 Duong Van (“Big”) Minh (1916 - 2001) Nicknamed “Big Minh” due to his height, he was a South Vietnamese general. 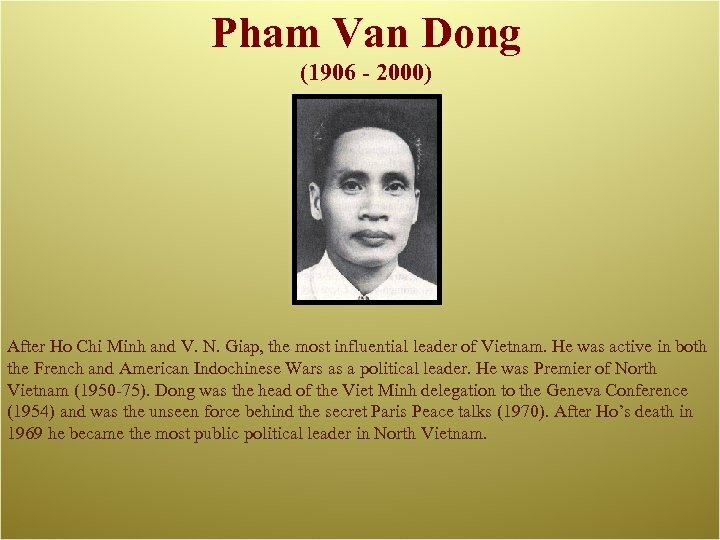 He took power briefly after the death of Diem but was quickly removed in a coup by Gen. Khanh. He played little or no role in the government of South Vietnam until the final days. After Thieu resigned (April 1975) it was thought that Minh would be more acceptable to the victorious communists. He surrendered the government to the North Vietnamese (April 30, 1975). 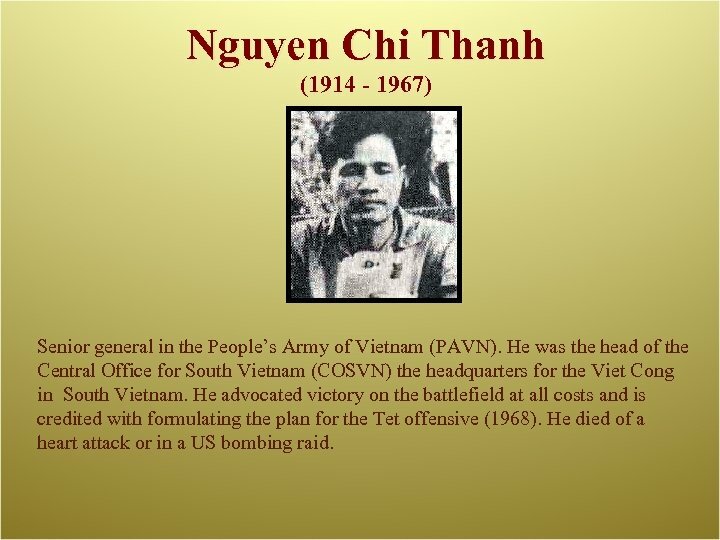 Nguyen Chi Thanh (1914 - 1967) Senior general in the People’s Army of Vietnam (PAVN). 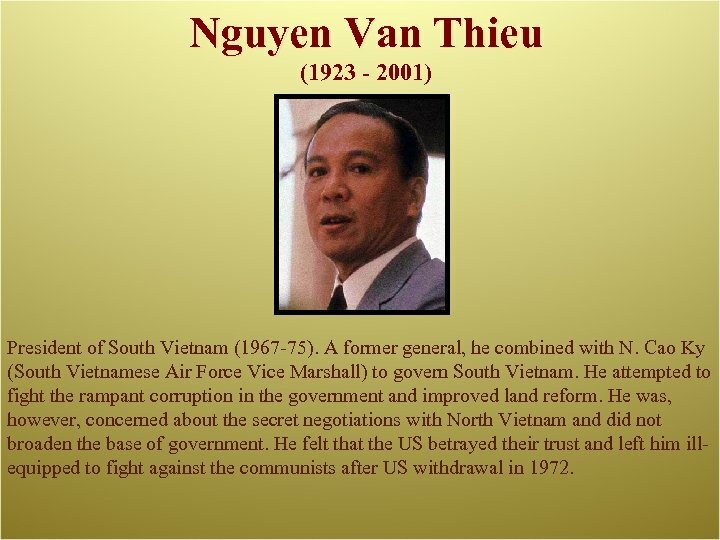 He was the head of the Central Office for South Vietnam (COSVN) the headquarters for the Viet Cong in South Vietnam. He advocated victory on the battlefield at all costs and is credited with formulating the plan for the Tet offensive (1968). He died of a heart attack or in a US bombing raid. Lyndon B. Johnson (1908 - 1973) President of the United States after the assassination of John Kennedy. A consummate politician who wanted to create a “Great Society” by passing a series of laws that would help eliminate poverty and social inequities. He inherited the war in Vietnam from Kennedy and was fearful be being perceived weak on communism if he failed to pursue to war against North Vietnam. His policies of gradualism failed and he lost support for his war policy and chose not to run for reelection in 1968. Robert S. Mc. Namara (1916 - ) Secretary of Defense under Kennedy, then LBJ. He was a former president of Ford Motor Co. He was initially in favor of a vigorous prosecution of the war and tried to use statistics to indicate favorable progress. He became increasingly disillusioned with the war and his inconsistencies caused Johnson to replace him. He resigned in 1967 to become President of the World Bank. He later admitted that he misunderstood the nature of the war in Vietnam. Mc. 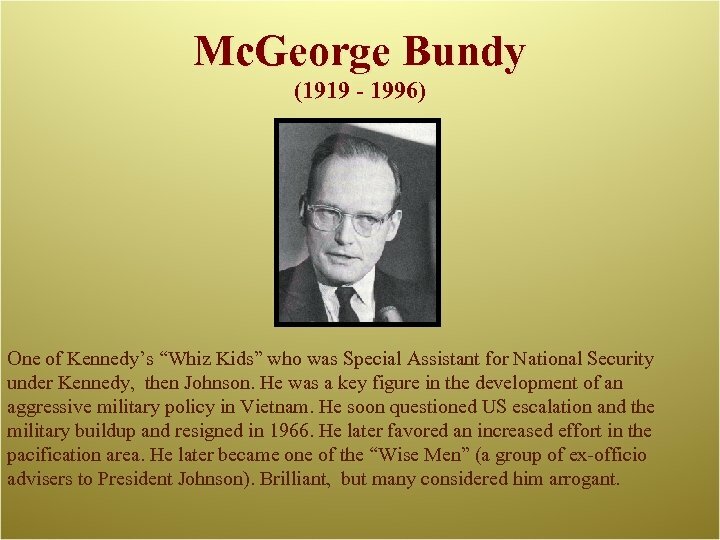 George Bundy (1919 - 1996) One of Kennedy’s “Whiz Kids” who was Special Assistant for National Security under Kennedy, then Johnson. He was a key figure in the development of an aggressive military policy in Vietnam. He soon questioned US escalation and the military buildup and resigned in 1966. He later favored an increased effort in the pacification area. He later became one of the “Wise Men” (a group of ex-officio advisers to President Johnson). Brilliant, but many considered him arrogant. 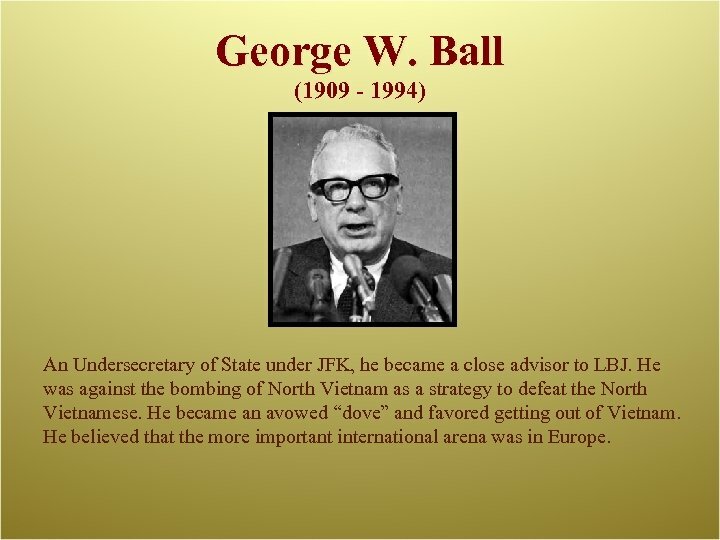 George W. Ball (1909 - 1994) An Undersecretary of State under JFK, he became a close advisor to LBJ. He was against the bombing of North Vietnam as a strategy to defeat the North Vietnamese. He became an avowed “dove” and favored getting out of Vietnam. He believed that the more important international arena was in Europe. 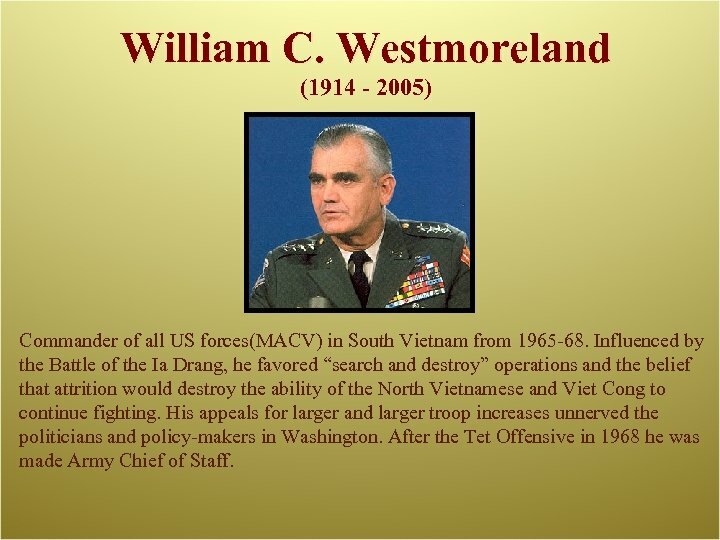 William C. Westmoreland (1914 - 2005) Commander of all US forces(MACV) in South Vietnam from 1965 -68. Influenced by the Battle of the Ia Drang, he favored “search and destroy” operations and the belief that attrition would destroy the ability of the North Vietnamese and Viet Cong to continue fighting. His appeals for larger and larger troop increases unnerved the politicians and policy-makers in Washington. After the Tet Offensive in 1968 he was made Army Chief of Staff. 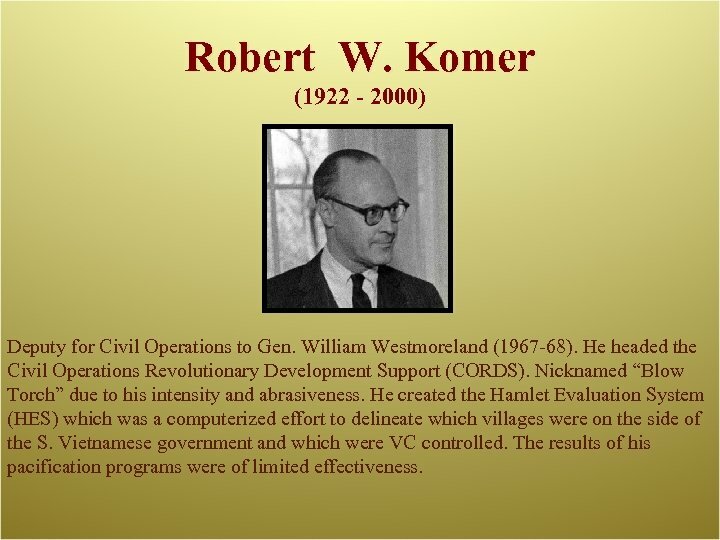 Robert W. Komer (1922 - 2000) Deputy for Civil Operations to Gen. William Westmoreland (1967 -68). He headed the Civil Operations Revolutionary Development Support (CORDS). Nicknamed “Blow Torch” due to his intensity and abrasiveness. He created the Hamlet Evaluation System (HES) which was a computerized effort to delineate which villages were on the side of the S. Vietnamese government and which were VC controlled. The results of his pacification programs were of limited effectiveness. 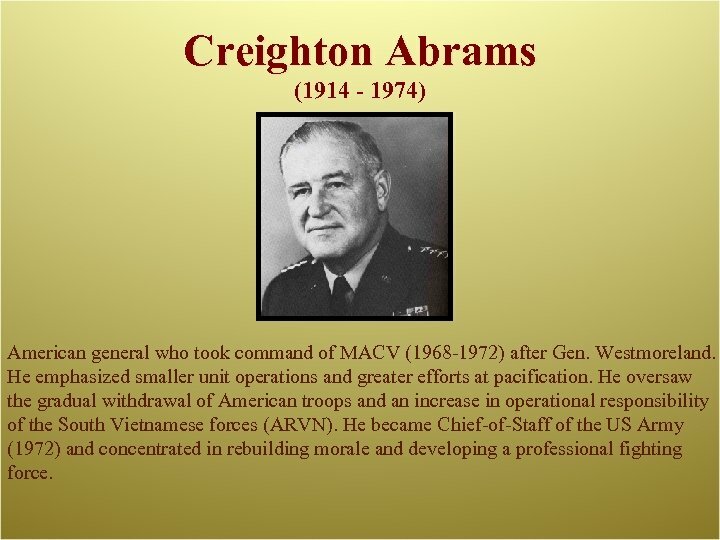 Creighton Abrams (1914 - 1974) American general who took command of MACV (1968 -1972) after Gen. Westmoreland. He emphasized smaller unit operations and greater efforts at pacification. He oversaw the gradual withdrawal of American troops and an increase in operational responsibility of the South Vietnamese forces (ARVN). He became Chief-of-Staff of the US Army (1972) and concentrated in rebuilding morale and developing a professional fighting force. 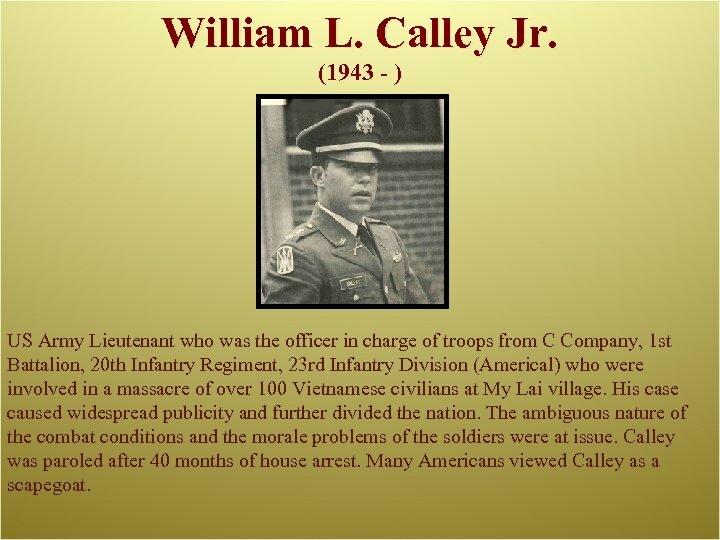 William L. Calley Jr. (1943 - ) US Army Lieutenant who was the officer in charge of troops from C Company, 1 st Battalion, 20 th Infantry Regiment, 23 rd Infantry Division (Americal) who were involved in a massacre of over 100 Vietnamese civilians at My Lai village. His case caused widespread publicity and further divided the nation. The ambiguous nature of the combat conditions and the morale problems of the soldiers were at issue. Calley was paroled after 40 months of house arrest. Many Americans viewed Calley as a scapegoat. Nguyen Van Thieu (1923 - 2001) President of South Vietnam (1967 -75). 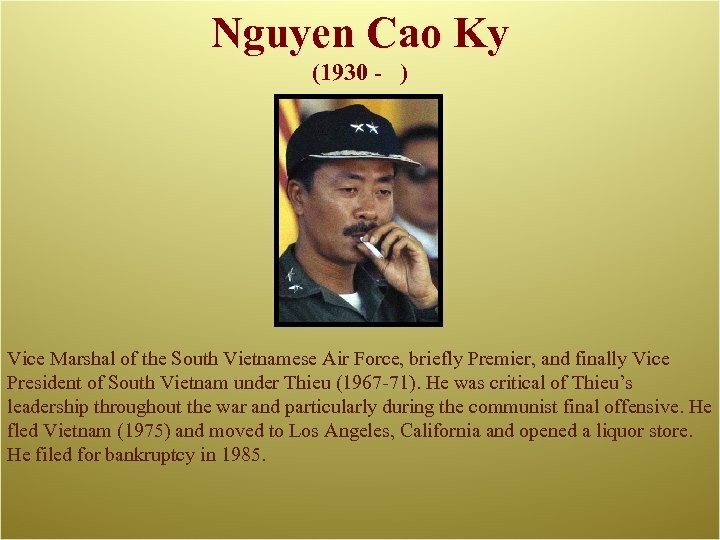 A former general, he combined with N. Cao Ky (South Vietnamese Air Force Vice Marshall) to govern South Vietnam. He attempted to fight the rampant corruption in the government and improved land reform. He was, however, concerned about the secret negotiations with North Vietnam and did not broaden the base of government. He felt that the US betrayed their trust and left him illequipped to fight against the communists after US withdrawal in 1972. Nguyen Cao Ky (1930 - ) Vice Marshal of the South Vietnamese Air Force, briefly Premier, and finally Vice President of South Vietnam under Thieu (1967 -71). He was critical of Thieu’s leadership throughout the war and particularly during the communist final offensive. He fled Vietnam (1975) and moved to Los Angeles, California and opened a liquor store. He filed for bankruptcy in 1985. 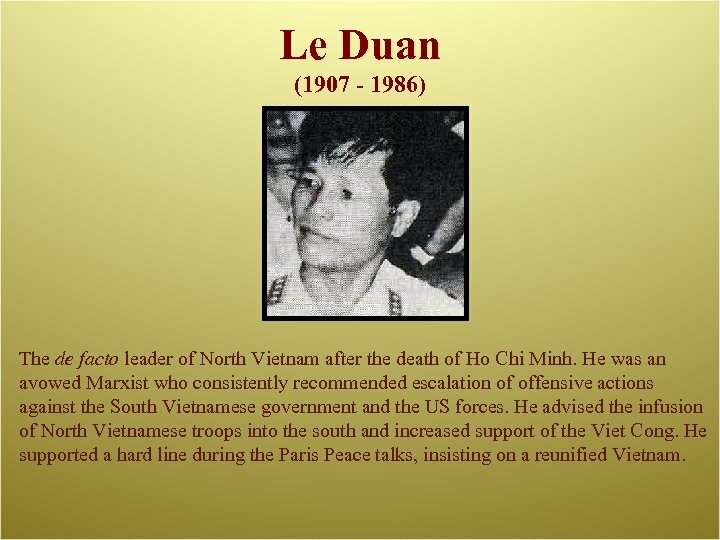 Le Duan (1907 - 1986) The de facto leader of North Vietnam after the death of Ho Chi Minh. 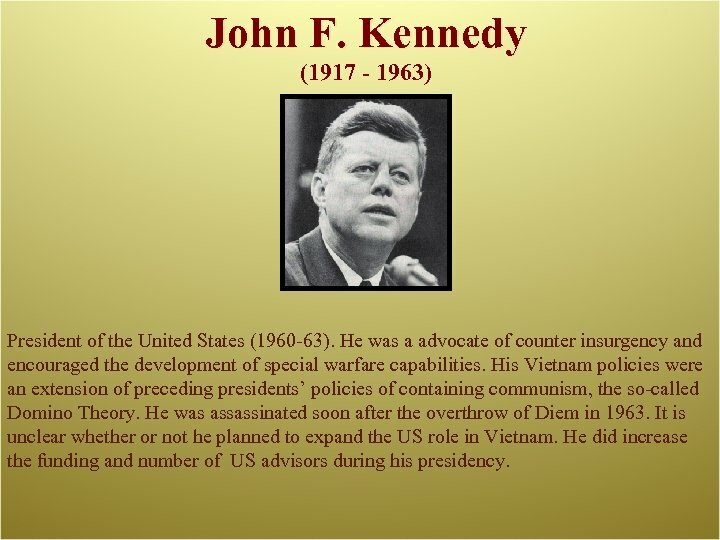 He was an avowed Marxist who consistently recommended escalation of offensive actions against the South Vietnamese government and the US forces. He advised the infusion of North Vietnamese troops into the south and increased support of the Viet Cong. He supported a hard line during the Paris Peace talks, insisting on a reunified Vietnam. Richard M. Nixon (1913 - 1994) President of the US (1969 -74). Promised to withdraw US forces from Vietnam. Accelerated the program of Vietnamization already in place. He initiated better relations with communist China. 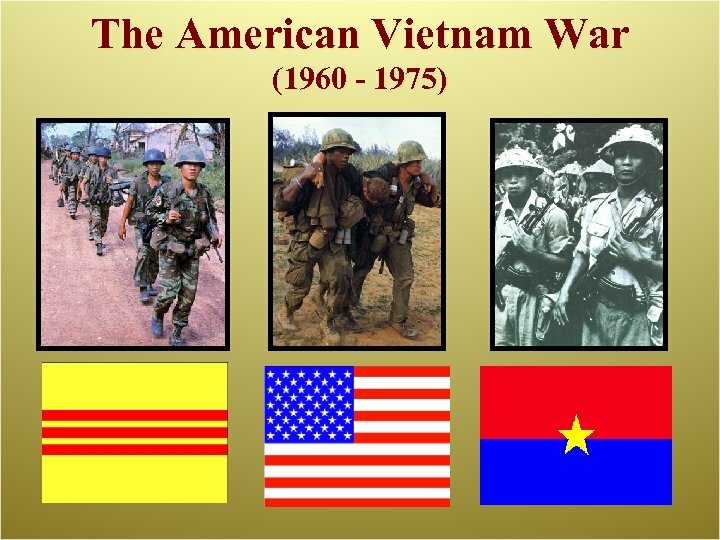 The Cambodian incursion and secret bombing in Cambodia helped unleash a civil war and dramatically increased war protest in the United States. He increased the bombing of North Vietnam to force the communist government to negotiate a peace agreement. Left office in disgrace as a result of the Watergate scandal. 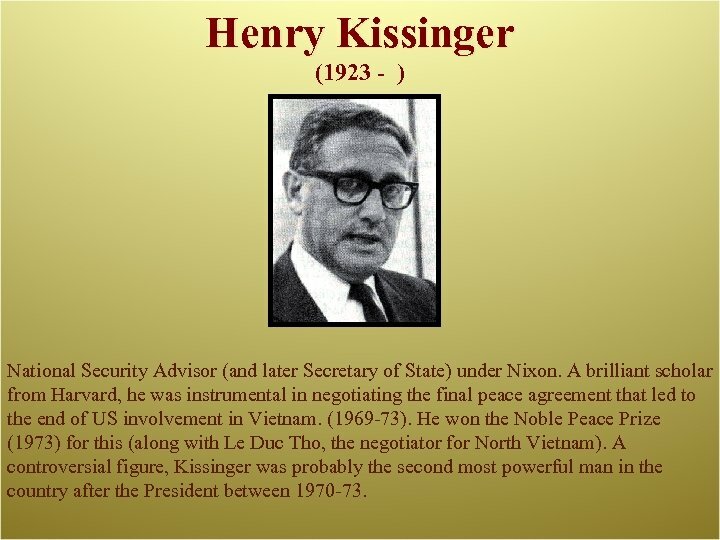 Henry Kissinger (1923 - ) National Security Advisor (and later Secretary of State) under Nixon. 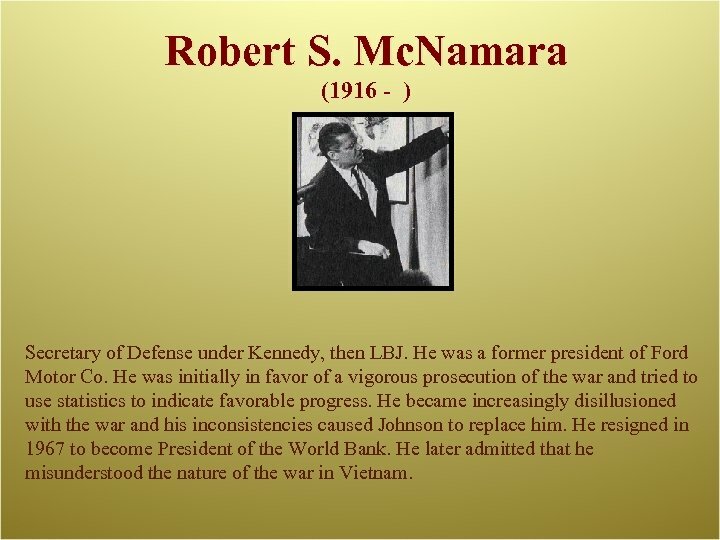 A brilliant scholar from Harvard, he was instrumental in negotiating the final peace agreement that led to the end of US involvement in Vietnam. (1969 -73). 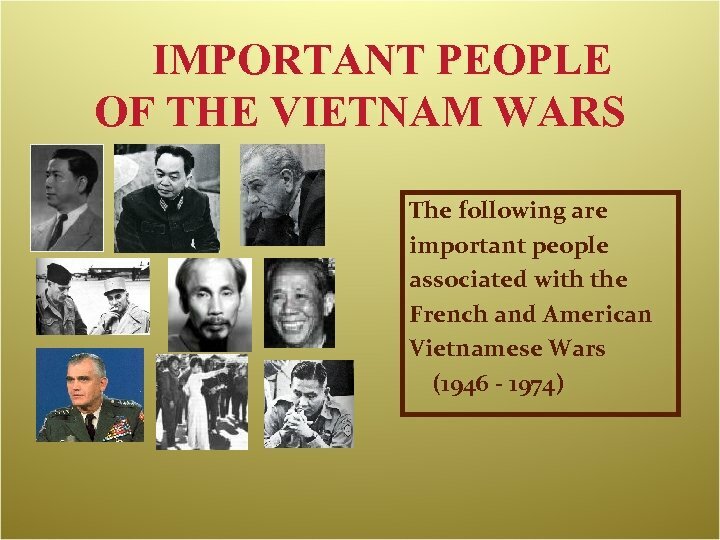 He won the Noble Peace Prize (1973) for this (along with Le Duc Tho, the negotiator for North Vietnam). A controversial figure, Kissinger was probably the second most powerful man in the country after the President between 1970 -73. 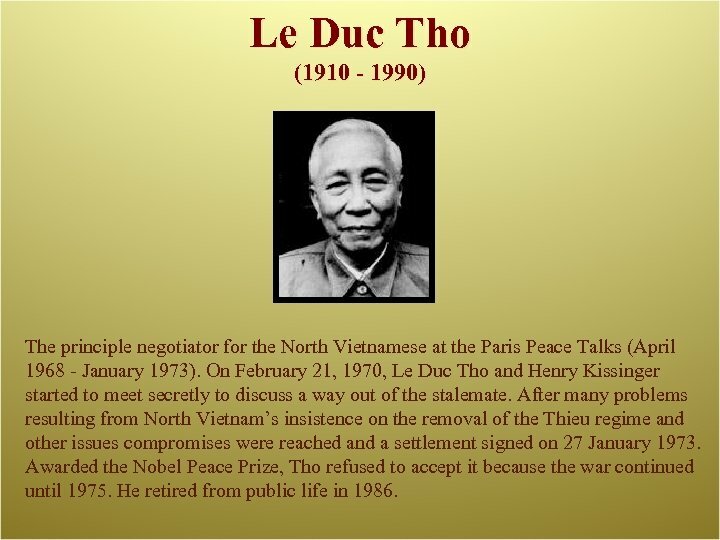 Le Duc Tho (1910 - 1990) The principle negotiator for the North Vietnamese at the Paris Peace Talks (April 1968 - January 1973). On February 21, 1970, Le Duc Tho and Henry Kissinger started to meet secretly to discuss a way out of the stalemate. After many problems resulting from North Vietnam’s insistence on the removal of the Thieu regime and other issues compromises were reached and a settlement signed on 27 January 1973. Awarded the Nobel Peace Prize, Tho refused to accept it because the war continued until 1975. He retired from public life in 1986. 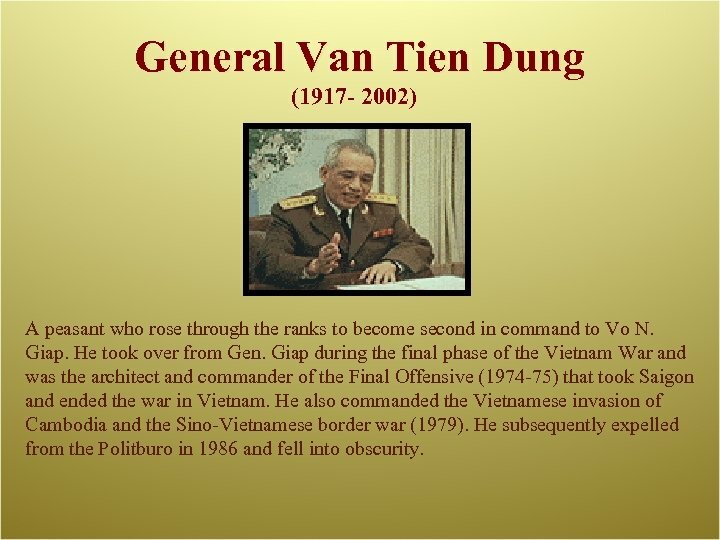 General Van Tien Dung (1917 - 2002) A peasant who rose through the ranks to become second in command to Vo N. Giap. He took over from Gen. Giap during the final phase of the Vietnam War and was the architect and commander of the Final Offensive (1974 -75) that took Saigon and ended the war in Vietnam. He also commanded the Vietnamese invasion of Cambodia and the Sino-Vietnamese border war (1979). He subsequently expelled from the Politburo in 1986 and fell into obscurity. 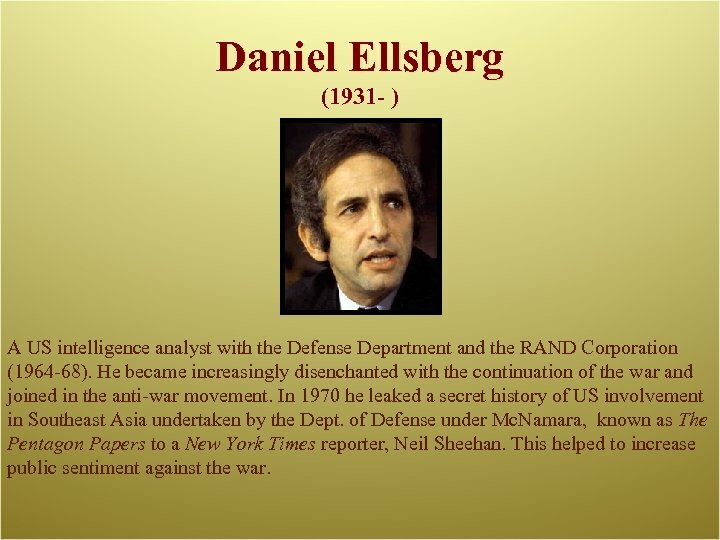 Daniel Ellsberg (1931 - ) A US intelligence analyst with the Defense Department and the RAND Corporation (1964 -68). He became increasingly disenchanted with the continuation of the war and joined in the anti-war movement. 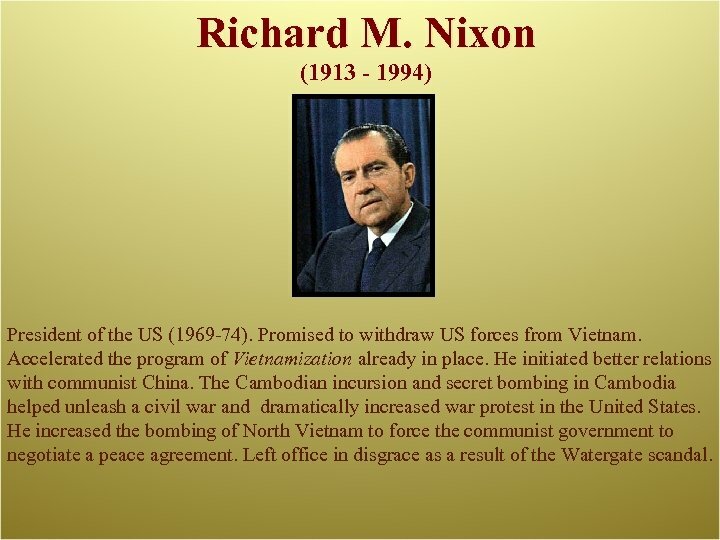 In 1970 he leaked a secret history of US involvement in Southeast Asia undertaken by the Dept. of Defense under Mc. Namara, known as The Pentagon Papers to a New York Times reporter, Neil Sheehan. This helped to increase public sentiment against the war. 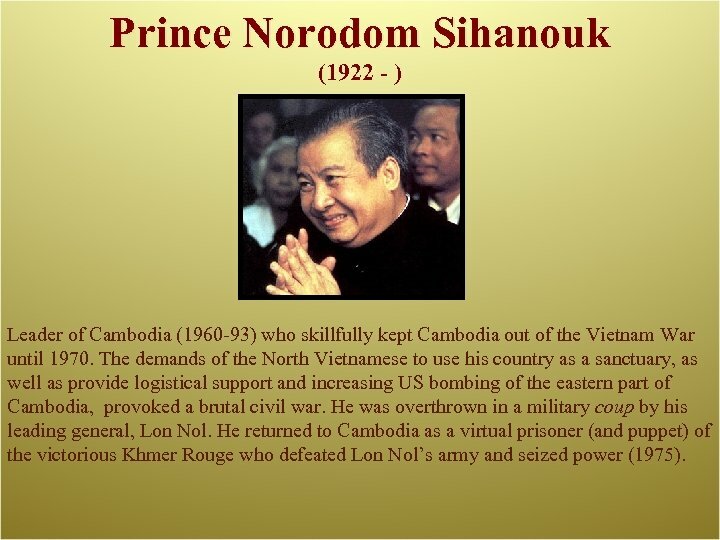 Prince Norodom Sihanouk (1922 - ) Leader of Cambodia (1960 -93) who skillfully kept Cambodia out of the Vietnam War until 1970. The demands of the North Vietnamese to use his country as a sanctuary, as well as provide logistical support and increasing US bombing of the eastern part of Cambodia, provoked a brutal civil war. 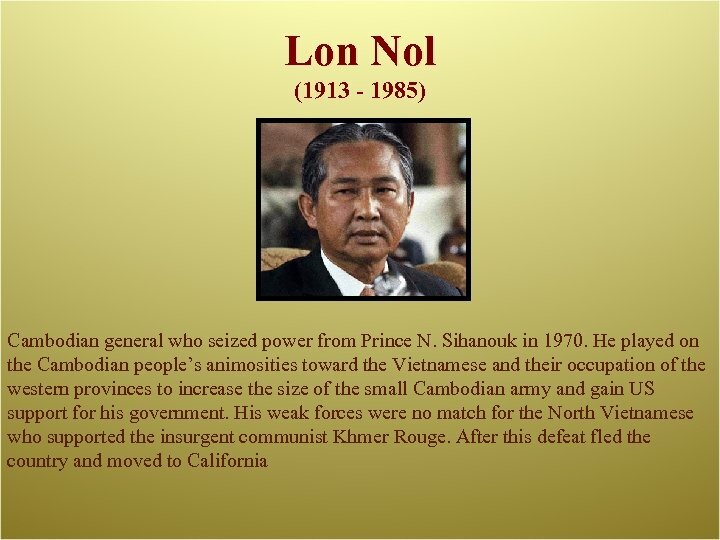 He was overthrown in a military coup by his leading general, Lon Nol. He returned to Cambodia as a virtual prisoner (and puppet) of the victorious Khmer Rouge who defeated Lon Nol’s army and seized power (1975).